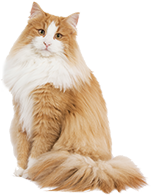 For cats 5-9 lbs feed 1/3 to 2/3 cup of dry alone, combine ¼ to ½ cup with one 3 oz can of wet or mix up to 1/3 cup with two 3 oz cans. For a cat of 10-14 lbs feed 2/3 to 1 cup of dry alone, combine ½ to ¾ cup with one 3 oz can or mix 1/3 to 2/3 cup with two 3 oz cans. brewers rice, poultry by-product meal, corn gluten meal, animal fat preserved with mixed-tocopherols (form of vitamin e), ground yellow corn, soybean meal, animal liver flavor, chicken, turkey, phosphoric acid, calcium carbonate, salt, natural and artificial flavors, potassium chloride, dried yeast, choline chloride, added color (red 40, yellow 5, blue 2 and other color), taurine, zinc sulfate, ferrous sulfate, vitamin e supplement, niacin, manganese sulfate, vitamin a supplement, calcium pantothenate, thiamine mononitrate, copper sulfate, riboflavin supplement, vitamin B-12 supplement, pyridoxine hydrochloride, folic acid, vitamin D-3 supplement, calcium iodate, biotin, menadione sodium bisulfite complex (source of vitamin k activity), sodium selenite.